Yup! 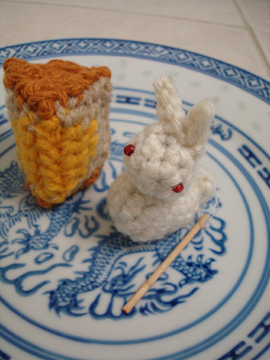 With the absence of real mooncake and rabbit lantern today, I’ve made crocheted versions of them to celebrate! When I was a child my parents used to buy me lanterns to celebrate Mid‐Autumn Festival, and the rabbit lantern is a classic one, probably has to do with the legend of the Moon Rabbit. 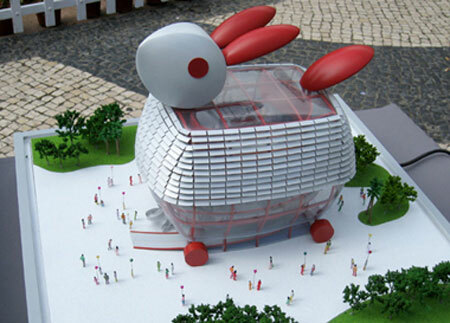 I can’t find a picture of a classic rabbit lantern, the Macau pavilion in the World Expo was the closest thing I could find. 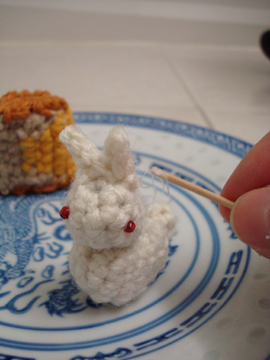 And here’s the crocheted rabbit lantern, complete with strings and a stick! 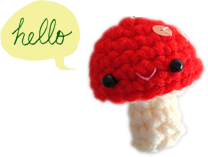 Row 4: sc in first sc, 2 sc in next sc, 1 sc in each of next 2 sc, leave a 12″ tail for sewing, fasten off. Row 1: ch 6, sc in second ch from hook, sc in each of next 4 sc, ch 1, turn. Row 2–4: sc in each sc across in back loop only, ch 1, turn. Row 5: sc in each sc across in back loop only, leaving a 12″ tail for sewing, fasten off. the back, with the ridges! Row 3: sc in first sc, switch to yellow yarn, sc in each of next 3 sc, switch to tan, sc in last sc, switch to yellow, ch 1, turn. Row 4: continue with yellow, 1 sc in each of next 4 sc, switch to tan, sc in last sc, switch to yellow, ch 1, turn. 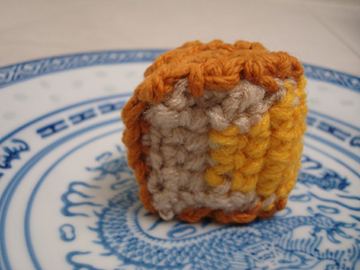 Row 5: continue with yellow, 1 sc in each sc across, leave a 12″ tail for sewing, fasten off. 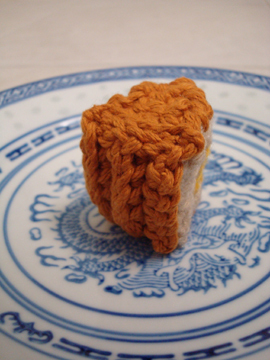 Sew top and bottom of the pastry shell to the back pastry shell, then sew the lotus seed paste and yolk pieces to the pastry shell, leaving front (yolk/yellow) edges open, stuff, then sew front (yolk/yellow) seam close. Weave in ends. 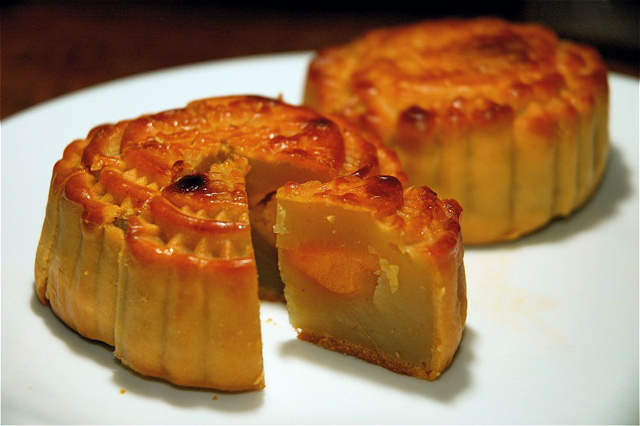 Happy Mid‐Autumn Festival! 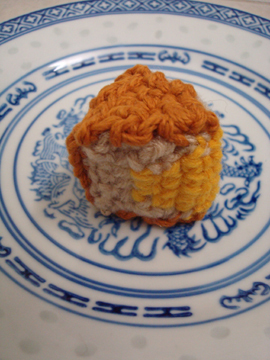 We have kept the moon cakes for you and Mike, you must remember to bring your crocheted versions of moon cake and lantern with you ah!